Anyone who thinks that Christianity and politics should never mix must be highly irritated at the moment. A week doesn’t seem to go by without some form of conference, event or launch where these two subjects take centre stage, giving media types more than enough to pontificate about in the process. As someone who has made a commitment to studying and discussing the matter on a regular basis, I have to say that I am greatly encouraged. As we head towards this year’s General Election, a growing movement is taking shape: the widespread involvement of Christians in politics, which has played such a crucial part in defining this nation’s history, is being rediscovered with a new-found passion and vigour. Last Saturday saw the turn of Christian Aid, the Children’s Society and Greenbelt coming together for their first ‘Faith in Politics?‘ conference at London’s City Temple. Given the ethos of Greenbelt in particular, along with that of the Rev’d Giles Fraser and self-confessed ‘bearded lefty’ Dr Rowan Williams, who were the headline speakers, there was a good chance that the day was going to have a more Socialist flavour to it. This was a curious thing to say when his entire address was centred about the need for more truth, trust, justice and other fundamental Judaeo-Christian values in our political system. However, despite the bashing of Ukip, the most controversial topic of the day had nothing to do with the usual concerns that our politicians fight over. Instead it was whether or not Jesus would vote. Talking about whether Jesus would vote is, of course, hypothetical, and at one level pointless: democracy didn’t exist in first-century Palestine. On another level, though, the conclusions we reach can potentially impact our attitude toward politics. 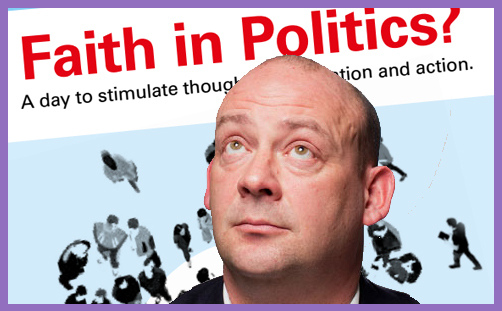 The danger with Giles Fraser’s thinking, despite his assertion that we can’t pin Jesus to one political party, is that by dismissing the alignments of some Christians involved in politics as being wrong, we come to the conclusion that Jesus would rule out voting for certain parties, and therefore so should we. If Jesus were on earth in this country right now, there’s every reason to believe that He would be befriending politicians and engaging with our contemporary politics, but for Him to actually vote would cause all sorts of serious problems of allegiance. It would be similar to the Queen doing the same. As the theologian NT Wright recently said: “The question of whether Jesus would have voted is rather like asking whether the referee is allowed to score a goal in a football match.” Jesus was fully human and also fully divine. How could God in Jesus align Himself through the ballot box to one party, which could then potentially claim to have Him on their side? Every political party is flawed: none is perfect when it comes to questions of truth and justice. Jesus’ purity and holiness can never be contained within man-made structures. But we are not God, and that makes things very different for us. We do get to vote, and there are decisions and consequences that go with that responsibility. Giles Fraser (and Lord Williams to a lesser extent) may think that Ukip and the Conservatives are not to be trusted, but there are plenty of Christians who have come to a different conclusion. The latest figures from the Evangelical Alliance put support for the Conservatives amongst Evangelicals at 28 per cent, and at 12 per cent for Ukip. Amongst Roman Catholics, who are traditionally the most left-leaning Christians, a recent poll found 29 per cent intend to vote Conservative and 13 per cent Ukip. To dismiss outright such a large number of fellow Christians is anything but helpful. Christians ought to be willing to have sensible, grown-up discussions about the merits and failings of different political parties and the flaws in their policies without jumping in and accusing those they disagree with of being somehow mentally deficient or treating them as outcasts. Winston Churchill once said: “Democracy is the worst form of government, except for all those other forms that have been tried from time to time.” Democracy isn’t faultless, but we could certainly do a lot worse. It’s what we have and we need to make the most of it. None of us can say for sure whether Jesus would have voted or not, but through our imperfect system we have a chance to do our bit to bring God’s kingdom (Judaeo-Christian) values into the world. When it comes to poverty, injustice, freedom and respect for each other, our democracy gives us the opportunity to edge things in the right direction. And just because some Christians believe that those values might just come from voting Ukip (or Green, or SNP), doesn’t mean they deserve to be belittled or to have their views peremptorily dismissed.